For many years very little had been known about these mysterious 'early' Canadian produced electric train sets and until recently almost no documentary evidence had been discovered. However, a great debt of gratitude is owed to a Mr Paul Cadorette - a former Sales Representative with Lines Bros. (Canada) Ltd. - who had the foresight to preserve a partial archive of his time with the company. This archive contained many fascinating original documents amongst which were included factory memos and other documentation relating to the production of the 1965-1966 sets. From these, it has been possible to construct a more complete picture of the story so far. 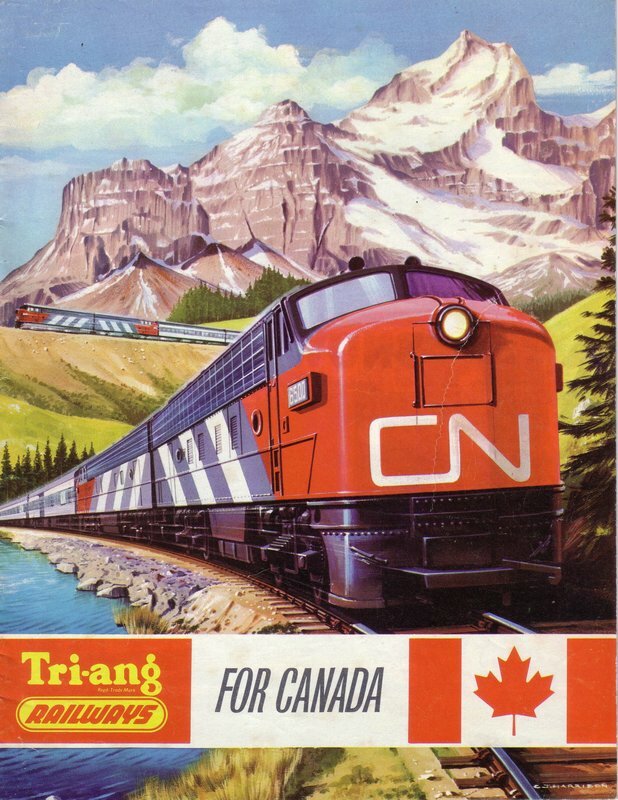 The 1965/1966 Canadian Catalogue records the conversion of much of the Transcontinental range into Canadian National Railways 'CN' livery. According to Richards Lines, this was as a result of some marketing co-operation with Canadian National Railways themselves. Initially, the choice was limited to Canadian National. 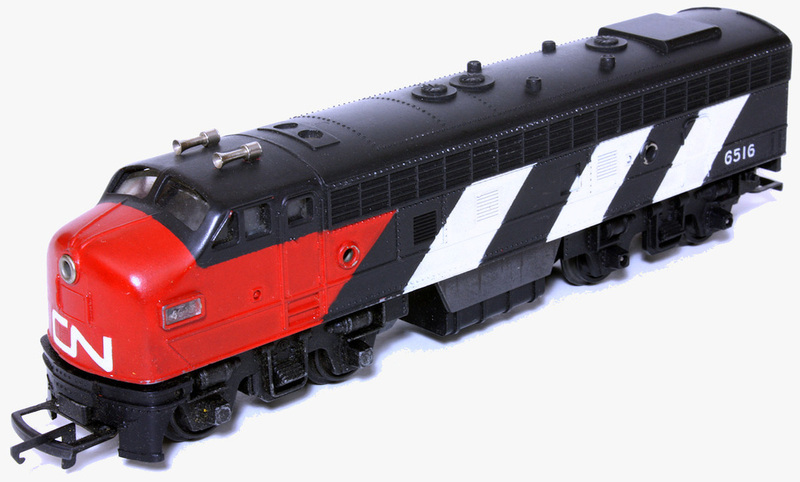 Surprisingly, it was not until 1967 that the Canadian Pacific models were added to the range. The year 1965 brought many changes for Tri-ang Railways in Canada. ​At about the time of the takeover of Meccano Ltd., due to financial problems, Lines Bros. (Canada) Ltd. decided to sell their Montreal factory and warehouse facility and move the company to smaller premises at Waterloo, Quebec, about 60 kilometres to the east of Montreal. A new warehouse extension for the assembly of train products was constructed there. Following the Lines Brothers takeover of the fallen Meccano Ltd. in 1964, after a long delay, Meccano Tri-ang Ltd. was eventually registered in Canada on the 23rd November 1965. The subsequent outcome was that, effectively, the business was transferred to Toronto, Ontario where there was much better storage accommodation. A new full-colour Canadian catalogue was produced, where previously the UK catalogue had been used and supplemented (up until 1962) by an illustrated price list. The 1965/1966 catalogue was probably issued late-August 1965 since the normal practice of issuing catalogues in Canada and the USA was in the Fall (Autumn). The 1966 catalogue insert shows the new Meccano-Tri-ang Ltd. address at 270 Islington Avenue South, Toronto, Ontario. Finally, and most importantly, the year brought the much demanded new Canadian livery models. A Lines Bros. (Canada) Ltd. memo dated June 8, 1965 gave information concerning the 'Assembly of Imported Products'. It stated that, 'The warehouse extension, where the assembly of trains and Scalextric will be taking place, is nearing completion and the following is an outline of our basic procedures covering: Ordering, Assembly, Stock Control, of the various components and finished items.' It makes reference to estimating quantities and specifications of the various standard and special sets contemplated and goes on to say that, 'Basically, for the season, "plan for" memos are being ... issued ... to order and line-up components and supplies'. As in the USA, sales of model railways in Canada tended to be seasonal. About two-thirds of annual sales would reasonably be expected to be made between August and Christmas. Normal practice would be that even though orders would be taken late spring or during the summer, the product is not necessarily available at the outset of accepting orders, especially for large retail chains. In Canada anyway, one of the reasons orders are taken at those times is to allow both the retailer and the manufacturer ample time to prepare. The benefit to the manufacturer is that it allows the required time for larger Christmas production runs, particularly of the Special Train Sets, and ensures that all orders can be satisfied while eliminating over production that might otherwise have taken place. 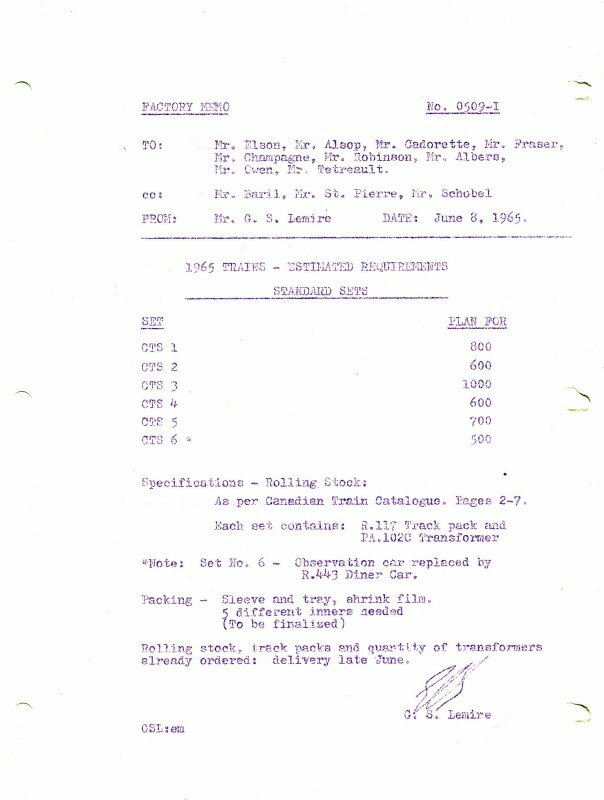 These "plan for" memos offer an insight into factory activity, decision making, planning, ordering and are very useful for dating operations. The factory reference material is invaluable in corroborating any evidence, deduction or supposition in what has been a very difficult area to research. Specifications - Rolling Stock: As per Canadian Train Catalogue, pages 2-7. Each set contains: R.117 (a misprint for R.167) Track Pack and PA.102C Transformer. * Note: Set No.6 - Observation Car replaced by R.443 Diner Car. Packing - Sleeve and tray, shrink film. Rolling stock, track packs and quantity of transformers already ordered: delivery late June. Of note, the memo states that 5 different inner trays would be needed but this was to be finalised; Sets CTS.2 and CTS.6, being both Diesel Passenger Sets, could share the same design inners if required. However, in the end, separate Inner tray designs for each of the six sets were finally approved. Locomotives and rolling stock were initially individually boxed in 'Tri-ang Railways' boxes but, as existing stocks became exhausted, a mixture of 'Tri-ang Railways' and 'Tri-ang Hornby' began to appear. The R.167 Track Pack always appeared in 'Tri-ang Hornby' packaging. The numbering of Canadian sets can be confusing. 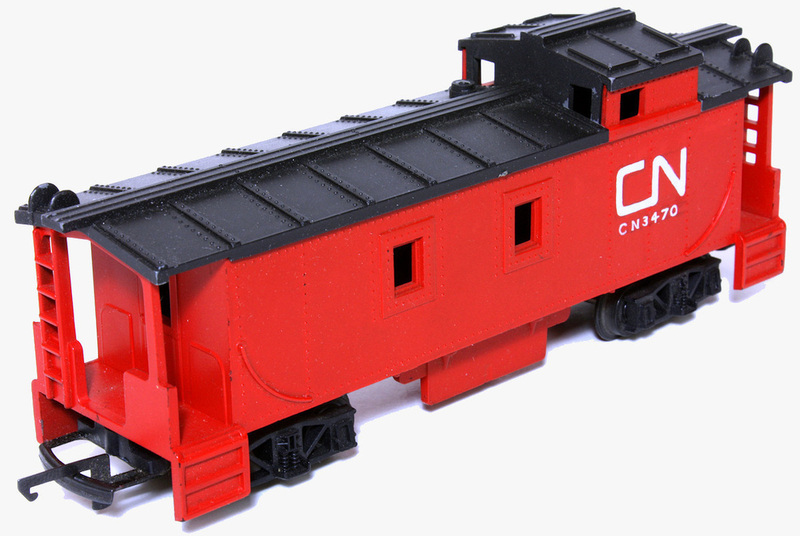 For 1965, the Standard Sets were numbered from CTS.1 to 6; 'CTS' standing for Canadian Train Set. ​The Presentation Sets were numbered from CPS.1 to 4; 'CPS' meaning Canadian Presentation Set. But, the Special 1965 Train Sets produced for the department store chains and mail order companies were numbered from Set No 651 to 654; the first two digits '65' referring to the year of manufacture. In 1966 the Standard Sets continued with the same 'CTS' numbering. The 'CPS' prefix was dropped from the Presentation Sets and they were numbered as Set No.1 to 5 (or #1 to 5 - depending on which Tri-ang Railways publication you happen to be reading). The Special 1966 Train Sets continued with the 'CTS' prefixes added to the three-digit number; again the first two digits '66' indicating the year of manufacture. An 'R' suffix was also added to some sets (e.g. CTS.661R) the purpose of which is now believed to indicate that the set was intended for sale in retail stores only (and not for sale and distribution through the Home Shopping / Mail Order Catalogues issued by some large retail stores). These sets continued to be available until approximately Autumn 1967 when new sets were introduced and the set numbering system was again altered, as it was done several times in the following six years.